Welcome to La Casita website terms and conditions for use. These terms and conditions apply to the use of this Website, in restaurant promotions and our data collection policy. By accessing this Website and/or contacting us via email or telephone you agree to be bound by the terms and conditions set out below. If you do not agree to be bound by these terms and conditions, you may not use or access this Website. La Casita adheres to GDPR regulations which came into place on May 25th 2018. We allow the customer to opt in to joining our mailing list and keep a trace of how and when this occurred. If you’d would like to unsubscribe at any time you can by emailing us at: chef@littlehouseoftapas.co.uk or by clicking the unsubscribe link which appears in the footer of email communications. email – we will from time to time email you with offers, events and promotions run by La Casita. You will only receive these communications if you opted in to be part of our email mailing list. phone number – we will ask for your phone number when you book a table with us. We do not contact you via SMS with promotions following this. name – we will ask for your name when you book a table with us. It is La Casita’s retention policy to keep customer data for 2 years. The policy starts from the date of interaction with us. Once the retention date has been reached we (inclusive of service providers) will delete any record of you from our order systems. If you opted in to hear from us via email, your email will remain on the database for the purpose of marketing to you. Please note that in the event of no activity over a 2 year period, your email will be removed from our system. In this instance no activity will be deemed as “no email opens” in the 2 year period of you being on your database. These Conditions govern our relationship with you. Any changes to these Conditions must be in writing and signed by both parties. Your Statutory Rights are not affected by these terms and conditions. Nothing in this Clause shall limit or exclude our liability in respect of any fraudulent or negligent misrepresentation whether or not such has become a term of the Conditions. If at any point you are not satisfied with your experience at La Casita, please contact us to speak to a member of the team about your query. You’ll need to provide us with details of your visit including date of visit and restaurant location. We’ll always do our best to make sure that you’re satisfied with the outcome. When you use this Website and our booking partner Quandoo, we will ask you to input and will collect Personal Information from you such as your name, e-mail address and telephone number. We, La Casita is the data controller and we use your information to process and confirm your booking with us. From time to time we might have to contact you if there is an issue with your booking. In the first instance you will be contacted via telephone and following no response from this we will email you using the email address provided. We may collect this information even if you do not book with us. You will not hear from us if you did not opt in to receiving email communications. La Casita does not send out any direct mail and we do not collect address information. When entering any of our contests or prize draws, you provide your name, email address. If you win, we will contact you regarding the prize by email. When you enter a contest or prize draw, you are not automatically included in our newsletter, if you have opted in to hear from us via email you will receive notice of promotions, specials and new additions to the Website. You may unsubscribe from this news list by following the unsubscribe instructions in any email received. Do not track (DNT) is a feature offered by some browsers, with some newer browsers offering it as default. If you enable it, it sends a signal to websites to request that your browsing isn’t tracked, for example by third party ad or social networks, or analytic companies. You can opt out of tracking and analytics on this website by changing your settings. The competition is open to residents of the United Kingdom and excludes employees of La Casita and their close relatives and anyone otherwise connected with the organisation or judging of the competition. There is no entry fee to take part in promotions / offers. By making use of offers and promotions, the participant is indicating his/her agreement to be bound by these terms and conditions. Only one offer can be redeemed by the dining party. Where applicable, multiple entries from the same person will not be valid. Use by date for promotions will be clearly stated at the time of the promotion. After the date stated the promotion will not be valid. No responsibility can be accepted for promotions not being received for whatever reason. The rules of the promotion and how to enter will be clear upon announcing the promotion. The promoter reserves the right to cancel or amend the promotion and these terms and conditions without notice in the event of a catastrophe, war, civil or military disturbance, act of God or any actual or anticipated breach of any applicable law or regulation or any other event outside of the promoter’s control. Any changes to the competition will be notified to entrants as soon as possible by the promoter. The promoter is not responsible for inaccurate offer details supplied to any entrant by any third party connected with this promotion. The offer will be made clear upon announcement of the promotion. In the event of the promotion requiring a winner, the winner(s) will be chosen at random from all entries received. In the event of there being a winner, the winner will be notified within 28 days of the closing date. If the winner cannot be contacted or do not claim the prize within 14 days of notification, we reserve the right to withdraw the prize from the winner and pick a replacement winner. The promotions and these terms and conditions will be governed by English law and any disputes will be subject to the exclusive jurisdiction of the courts of England. Every Wednesday 2-4-1 gin. 2-4-1 must be quoted for the offer to be valid and the cheapest gin is free. Participants must be over 18 years age. All You Can Eat – Last Sunday of every month. £20 per head, booking recommended. This event does not occur in the month of December. Live flamenco guitar – keep an eye out for performance dates at your favourite venue. Double points on Sundays using the La Casita Loyalty App during the month of February. Present the app after dining at La Casita on Sundays during the month of February and double points will be allocated to your account. Please allow 48-72 hours for the points to show. In order to redeem points, you need to register your debit/ credit card details to La Casita Rewards loyalty app. For every £1.00 you spend at participating sites on food and drink you will earn 1 point to redeem when visiting any one of our restaurants. You cannot earn points on gift vouchers and money off using the app cannot be redeemed in conjunction with any other promotional offer La Casita might be running. On the home and wallet sections of the app, you will be able to see how many points you have earned. If you wish to redeem your rewards you will need to have points equalling the value of the points shown under each reward. While registering to become a member through the app, you will be asked to provide certain personal information in accordance with the requirements of the Data Protection Act and we will take all reasonable steps to ensure that your personal data is kept secure against unauthorised access, loss, disclosure or destruction. By downloading the La Casita App you consent to providing your date of birth. We use this information to send push notifications to you on the date of your birthday. We also use this information to ensure you are legally old enough to take part in promotions run by La Casita that involve alcohol including but not exclusive to beer, wine, spirits and aperitifs. La Casita Tapas restaurants shall not be held liable for any default resulting directly or indirectly from any cause beyond our control, including but not limited to, failure of network services and failure of data processing systems. As a consumer, you have legal rights in relation to goods that are not of a satisfactory quality or fit for purpose and services not carried out with reasonable care and skill. Advice about your legal rights is available from your local Citizens’ Advice Bureau or trading standards office. Nothing in this Agreement will affect these legal rights. We reserve the right to amend or waive any provision of this Agreement from time to time and at any time, or to terminate the La Casita Loyalty app program (and therefore your Membership) on reasonable notice. You should check this page of the Website from time to time to take note of any changes we make, as they are binding on you from the date that we make them. Subject to the paragraph below, any dispute or claim arising out of or in connection with this Agreements or its subject matter or formation (including non-contractual disputed or claims) will be governed by English law. As a consumer, you will benefit from any mandatory provisions of the law of the country in which you are resident. Nothing in these agreements, including the paragraph above, affects your rights as a consumer to rely on such a mandatory provision of local law. Any dispute or claim arising out of or in connection with this Agreement or its formation (including non-contractual disputed or claims) shall be subject to the non-exclusive justification of the courts of England. If you are a consumer resident in Northern Ireland, you may also bring proceedings in Northern Ireland, and if you are a resident of Scotland, you may also bring proceedings in Scotland. In order to redeem points, you need to register with both your personal details and debit/credit card details to the La Casita loyalty app. You cannot earn points on any pre-bought vouchers purchased from any third-party sites. Your reward cannot be redeemed in conjunction with any other promotional offer run by La Casita at the time. On the wallet and home section of the app, you will be able to see the value of the rewards you have earned. If you wish to redeem your points, you need to have accumulated the minimum number of points required for a reward shown on the app. The redemption process on all rewards requires you to confirm that you are happy to redeem your reward and exchange that reward for the necessary value stated. Each reward will provide a unique code and countdown timer, this must be presented to a member of staff so that the relevant La Casita staff member can apply this on your behalf. Please redeem you rewards while in a La Casita venue as there is a 10 minute countdown timer set on each reward. The reward presented must have a valid code and a live countdown timer in order for the chosen reward to be successfully claimed and applied to your bill. 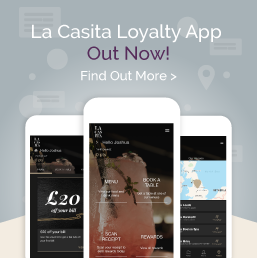 What is the La Casita Loyalty App? The La Casita Loyalty app is an app-based incentive program to reward our loyal customers who frequently spend with us. It’s very simple to sign-up and start redeeming rewards. Simply download the app, register your payment card and instantly start earning money that can be redeemed off future purchases. How do I register on the app? Visit the App Store or Play Store and search for La Casita Loyalty App. Download the app and click ‘Get Started’. Follow the instructions to register your details and add your payment card to get started. How does my money accumulate on the app? As long as you have registered the payment card that you use to pay your La Casita bill then the money will be added automatically. It can take up to 72 hours for the money to register on your app. How do I report missing points? Remember, it can take up to 72 hours for all points to be accounted for on your account, but don’t worry, if any points are missing just let us know with a picture of your receipt via info@littlehouseoftapas.co.uk and we will get it sorted for you. How do I remove/add card details? Editing card details is found in your profile via the menu bar at the bottom of the app, on your profile click the “MY CARDS” tab. To add your card, click the “ADD CARD” button. To remove your card, tap on the card you want to remove and select the delete option. Can I redeem point at All You Can Eat La Casita Events? Rewards and money redemption cannot be used in conjunction with any other events / promotional opportunities La Casita offer. All You Can Eat cannot be used as an opportunity to collection points. What happens if multiple diners on one booking have the loyalty app? This is absolutely fine as we can split the points accordingly against the payment of each individual based on their spend when splitting the bill. You have the choice to split the points based on multiple diners using their app or one diner claiming all the points on one loyalty app. This can be found in your profile via the menu bar at the bottom of the app, in your profile click the “PREFERENCES” tab. To change your password, click the “Reset Password” option, this will then confirm if you want to reset your password, click request reset. You will then receive an email with steps to follow in order to change your password. Please remember to check your junk mail just in case. Yes, points will expire within 12 months.